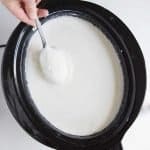 Slow cooker yogurt is an easy, healthy, and inexpensive way to make homemade yogurt without a yogurt maker. Yogurt can be expensive and often times it has a long list of artificial colors, flavors, and who knows what else. 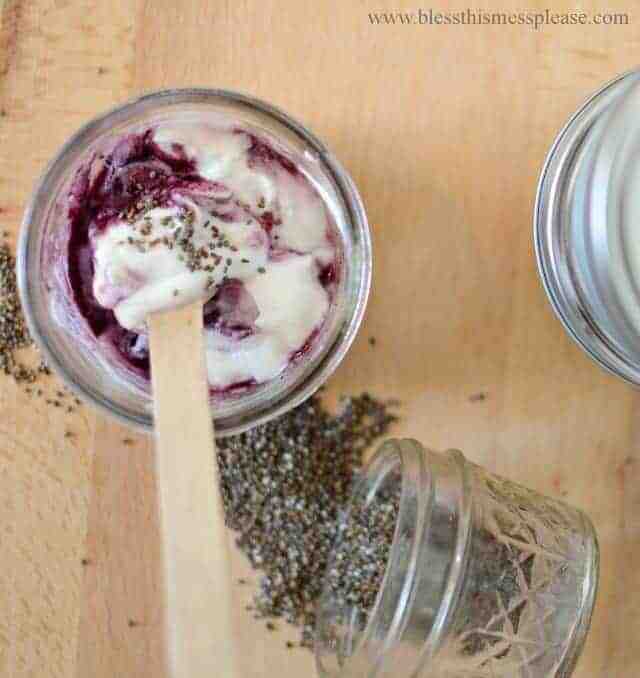 So here is a super easy recipe to make your own slow cooker yogurt. It is plain yogurt, but you can add honey, jams, fresh fruit, and just about anything else you like. I also use it in place of sour cream in most recipes. This is a great way to to get organic yogurt on the cheap. You can buy a carton of organic milk and turn it into yogurt for about half the price of organic yogurt. The recipe is so easy that it practically makes itself. You just have to commit a little time to the process! You essentially just use your slow cooker to scald the milk and then the heavy warm crock radiates heat all night long to help culture your new batch of yogurt. The hands-on time is about 5 minutes, though the waiting time is about 15 hours. I like to start this in the afternoon so that it’s ready to sit for its long 8-12 hour warm resting period overnight. We then wake up to fresh yogurt and I’ll serve it with fresh fruit and some homemade granola. I really recommend straining this yogurt through 3-4 layers of cheese cloth for a few hours too. This helps it to thicken up to a more “Greek yogurt” consistency which my kids prefer (and it’s easier to eat). I explained more of how I do that in the tips and tricks section. Before you know it, you’ll know how to make homemade yogurt with your eyes closed. I’d highly recommend getting a little instant-read thermometer to make homemade yogurt – it’s all about the temperature! I use this $10 thermometer all the time. The goal is to scald the milk which takes place around 180 degrees. So you could check it with a thermometer the first time to see if the “warm” setting is warm enough or if maybe an hour and 45 minutes would work on low. Once you figure it out, I don’t think you would have to use the thermometer every time. After the milk is scalded, the waiting time is meant to bring the milk down to around 115-110 degrees so that it’s still warm but won’t kill your yogurt culture! You don’t have to buy commercial plain yogurt every time. Just save 1/2 cup of your own yogurt for the starter for the next batch. I like to make homemade fruit-on-the-bottom yogurt cups with this yogurt. My kids love them and they are a simple individual snack they can serve themselves. I really recommend straining this yogurt through 3-4 layers of cheese cloth for a few hours, too. This helps it to thicken up to a more “Greek yogurt” consistency which my kids prefer (and it’s easier to eat). I simply set a large colander in a bowl, line it with cheese cloth, and then pour my yogurt in from the slow cooker. I cover it with a clean dish towel and let it sit for a few hours until it’s the consistency that I like. Do note that the yogurt will also thicken some when refrigerated. Play around with it until you figure out how thick or how thin you prefer your yogurt and make notes. That’s the perk of cooking from scratch – you get a product that is truly customized to your preferences. In a large crock pot, add the milk. Turn it on low for around 2 1/2 hours. After that time has passed, unplug the crock pot and let it sit for 3 hours. I always set a timer for these or I don’t remember. After the 3 hours has passed, stir in the 1/2 cup of yogurt. Replace the lid of the crock pot and cover with 2 big towels or a blanket. Let rest for 8 to 12 hours (overnight works well). In the morning you’ll have yogurt! Place it in a 1/2 gallon mason jar and refrigerate for a few hours before serving. It will thicken up in the fridge. Keep a 1/2 cup of this yogurt for your next batch and say goodbye to buying yogurt! You can also let the yogurt strain in cheese cloth in the fridge for a few hours and you’ll get a thicker Greek yogurt! After the milk is scalded the waiting time is menat to bring the milk down to around 115-110 degrees so that it’s still warm but won’t kill your yogurt culture! 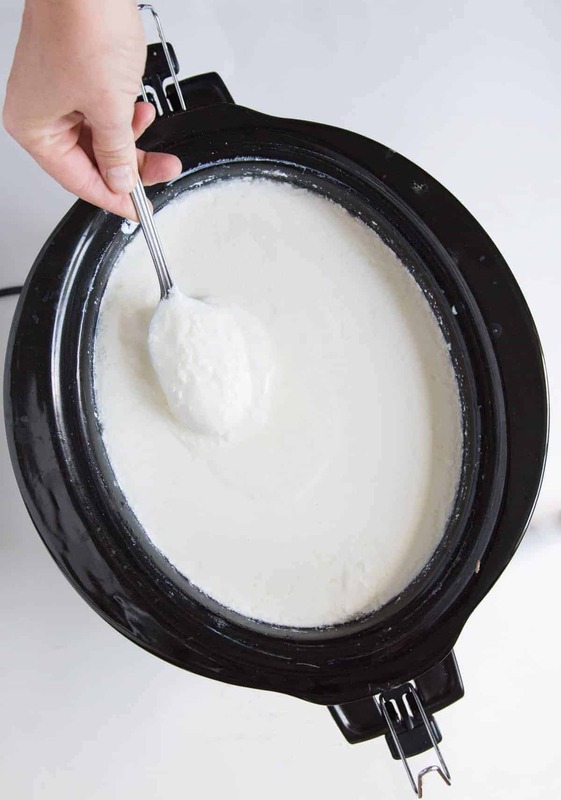 I bet you didn’t know you could make slow cooker yogurt that easily! And aren’t those two older pictures awesome? Did I really post a picture of a sideways bottle?! This recipe was originally published in July 2011 and has been updated September 2017. The recipe, pictures, and text have all been updated and improved for reader enjoyment and accuracy. I want to try this some time! Can I just say how much I love your recipes on here? Well, they are amazing. So I tried this about a month ago and my crock pot browned the edge, making a not-so-appetizing semi-crispy gelatinous ring around the top. I was thinking of setting my crock pot to the warm setting after being on low for the first hour- do you think it would still turn out okay? Let me know what you think! The goal is to scald the milk which takes place around 180 degrees. So you could check it with a thermometer the first time to see if the warm setting is warm enough or if maybe an hour and 45 minutes would work on low… once you figured it out I don’t think you would have to use the thermometer every time. I burned the milk in mine before too and it smelled so weird and good at the same time! After the milk is scalded the waiting time is to bring the milk down to around 115-110 degrees so that it’s still warm but won’t kill your yogurt culture! I just made another batch last night and I just love it. I make blueberry muffins that call for 1 1/2 cups yogurt for a batch, that’s why I make so much! They are the best muffins. I’ll post the recipe. I had no idea you had such a fun blog. Thanks for the comment, now I can keep up on yours! I’m interested in making my own yogurt and your version seems really easy. How long will it keep in the fridge and approximately, how much does it make? Thanks! The whole half gallon turns into yogurt, so it makes about 8 cups (very little is whey) and it keeps great! We eat ours pretty quick but it won’t start growing any bacteria for a week to 10 days! I think you’ll like it if you try it… it’s really quiet easy! Sorry to bring this up…. Am I the only one noticing the typo in the last sentence lol. Thanks for the recipe!!!. That’s an awesome typo, Erica! I had not noticed! Also, I love your website! 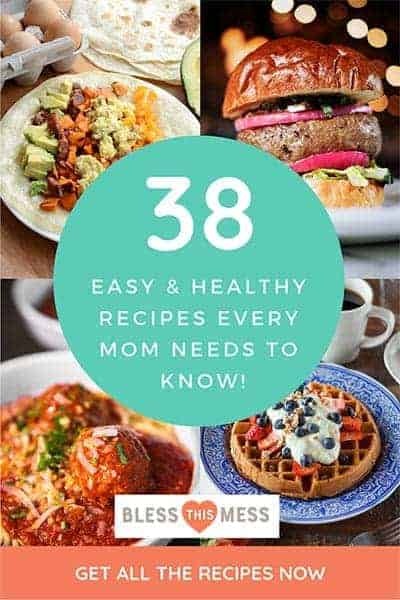 I have been cooking primarily from your recipes, and my family has liked all of it. Thanks so much! It just depends on your yogurt… it’ll last 7 to 10 days but once it starts to mold it will mold in the most amazing colors (mine was orange and pink last time I let it go!). I have no clue about freezing. In my mind it will ruin the live cultures that make it yogurt but I don’t know if that’s true or not. Good luck! My children’s pediatrician makes her own yogurt and said it is fine to freeze it. She wondered about the live cultures being affected but learned that it is fine to freeze! I am looking forward to trying this and some of your other clean eating recipes! Thanks for sharing! I don’t understand………it says no more buying store yogurt and store yogurt has artificial ingredients but didn’t you buy store yogurt and just add it to milk? You gotta start somewhere when it comes to yogurt and it’s live cultures… you buy that first initial tub of yogurt (and you should be buying the spendy stuff that is organic and free of odd things) and then you get to make your own. Once you do that though you never have to buy it again if you keep making it and keeping your own live cultures in the fridge. Several friends and I have tried it and it turned out great. Can you add vanilla to it to make it vanilla flavored during the process? Also, are there any tips to making it thicker? We are drinking ours but would love to be able to eat with a spoon too. I’m so glad you are having success with it! I get too nervous that I’ll kill the yogurt cultures to add much while it’s processing, but you sure could try adding vanilla. As far as the thickness goes – it’ll be more thicker the more fat your milk has, whole milk is your best option and you could even add a quart of cream to it. Also you could strain it in through cheese cloth overnight in your fridge to thicken it up and to make a more greek-style yogurt (I use what comes out in pancakes the next morning so that I don’t wast it). I’ve heard of people adding gelatin too but I haven’t ever tried it. Let me know how that works for you and thanks for the great feedback! Just making sure I understood what you said in a previous comment – you just use 1/2 cup of your current batch of homemade yogurt when it comes time to make the next batch, right? Yep! All the live and active cultures will now be in your homemade yogurt and you can use it in the future instead of the store-bought! Can you use almond or coconut milk in place of the dairy milk? I found you site through Pinterst. I love it! I started the crock pot yogurt yesterday. It turned out pretty watery but am hoping it will thicken up in the fridge. I can’t wait to make the granola and other recipes. Thank you for sharing! Could I replace the whole milk with raw goat milk? Yep, but after cooking it won’t be raw 🙂 I have done it with raw milk though it was excellent! I just tried this for the first time. It seems like it worked, however the yogurt is very very sour. 1) Is there something I can add to make it taste less sour? 2) Is there something I should do differently next time to prevent it from being so sour? Thanks! Hey you! What kind of milk did you use? Normally the more fat the milk has in it the better the flavor. Also, you could let it sit shorter than overnight. If the yougurt is set in say 6 hours then you could put it in the fridge and slow down the cultures that are making the yogurt. Hope that helps! Was wondering after putting it in the jar in the fridge, will the watery stuff and the yogurt seperate enough that the yogurt will be thicker, or do you actually have to strain it to make greek yogurt? Sometimes a bit of the whey will separate on it’s own and you can kind of dump it off, but straining really is the best option. You won’t get a true greek style yogurt with out straining it, that’s for sure. Good luck Beth! Hi! I was so excited to make this yesterday. I checked everything with a thermometer (Up to 180, cool to 110) but this morning I don’t have anything thick that even looks like yogurt. I feel like I now have to throw away a 1/2 gallon of whole milk! Bummed. I read your comments so I must be doing something wrong. Is it to scald at 180 degrees for the whole 2.5 hours? That could have been my problem as I had my Ninja crockpot on low and added 30 minutes as it still wasn’t to 180 degrees yet after the 2.5 hours. I will try this again if I can find the answer to why I only have sour smelling milk. Thanks! Do you know if your thermometer is right?? You can check it’s calibration by sticking it in pot of boiling water and it should read 212 degrees. I just did this a year or so ago and realized that my was off by a whopping 12 degrees (it’s a cheap one). That explains why I ruined so many batch of candy! Also, is your milk overly pasteurized? What culture did you use for your starter? I’d make cottage cheese with the milk if I were you (just search cottage cheese and you’ll find the how to on my blog). Does that help?! I sure hope so, no one like a recipe with poor results. Let me know friend! I came here looking for the answer to that exact answer. All the instructions here say “scold the milk” and say I should scold it at 180f but If any of them specify how long to hold at that temp, I’ve missed it and I apologize. But would you please answer it again? Thank you. No you don’t have to keep it at temperature for that time, you just need to get the milk up to 180 degrees and then it needs to sit without additional heat for about 2.5 hours while it cools off enough to have the starter added. So get it up to that temperature but you don’t need to maintain that temperature. I do have a crockpot but prefer to make my yogurt in a yogurt maker….it is just simpler for me and less fuss. I use skim milk but add a 1 1/2 cups of powdered milk while bringing my milk up to the 180 degrees. I also add about 1T of agave to the mixture. I put in fridge to bring down to the 105 – 110 degrees. I then add the 1/2 cup of plain yogurt with live cultures. Place in my 8 individual cups … set the timer and when complete I put the cups in the fridge. I get nice thick yogury and can add anything I want for additional flavor. I do eat this plain most of the time. The yogurt maker was bought online through Walmart…was about $22 and well I no longer purchase yogurt and in a two person household this is just right for us. How do you strain it? I don’t understand that step. I didn’t talk about that much huh! So I just like a colander with 2 or 3 layers of cheese cloth, set it in a bowl, add my yogurt to the colander, and then let it drain, covered, in the fridge, overnight. This lets the whey soak out and drain into the bowl and you’ll end up with a much thicker yogurt! Does that make sense? Let me know if you try it! when i let it sit for 8-12 hrs do i put it in the fridge?? No, leave it wrapped up in a blanket on the counter so that the cultures from your yogurt can multiply and turn the milk into yogurt! Thanks for all the directions and commentary. My batch turned out thin and pretty sweet. Is that normal? I was expecting some tang so I’m wondering if it failed. I used half and half and a nice organic grass fed yogurt(which was also pretty sweet). I think I added the culture at 105 so maybe my milk was too cold? Please tell me there is a way to sweeten this homemade yogurt! We need a little something to make it taste good. That’s what I do most of the time and it’s great. You can use jam too. I’ve heard of people even putting Jello packets but that’s not something I would do, but it doesn’t mean you might not want to try it. So many great ideas. Thank you for sharing! hi melissa ive just started a batch. couple questions. do i leave the lid off for first step? do you think i could freeze this is squeeze pouch for frozen yorgurt effect? Nope, put the lid on in the first step, and I’m not sure about the freezing. I haven’t tried it, but if you do I’d love to hear how it turns out. Making my second batch today and decided to infuse the milk with vanilla bean pods while warming. About to try this recipe – thank you so much for sharing! I happened to be strolling through my local farmers market this morning, and I picked up some local yogurt to use as my starter (in addition to all the fresh berries and honey I’ll be dressing it with after its finished). Can’t wait to try it! I’ll let you know how it turns out. This is THE best crockpot recipe for yogurt! A week or so most of the time, it depends on how it’s being stored and temperatures but it lasts pretty well. I would like to know if yogurt can be made from chocolate milk?? I have tried a recipe with cocoa, etc to make it chocolate but I didn’t care for taste the closest I found wad adding meanwhile or Swiss miss to flavor but that adds calories and chemicals. If’m made with chocolate milk would be better but wondered if anyone had tried. That is such a great question. I haven’t tried it but I really think it would work! If you do try, will you report back and let me know. Great idea! I love this yogurt! I make a gallon every week or so—I need plenty to share with friends and loved ones who also love it! Thanks for sharing. Thanks for sharing this! I’m making it right now 🙂 can’t wait to see it in the morning! This was my third try and it turned out to be the charm. The first two recipes resulted in a delicious yogurt but with a grainy texture. This time is was creamy and smooth. I used a slow cooker on low but after 2.5 hrs, the very cold whole milk temp had only reached 175 degrees. So I gave it another 30” and then let the milk cool to 110 degrees. My cover has a small opening in the cover for my thermometer, so I just left it in the whole time for both heating and cooling. I did mix very well six ozs. of whole yogurt with two cups of the 110 degree milk and mixed that well into the other six cups of milk. Then I poured the mixture into 12 6oz jars and cooked it an additional five hours in an inexpensive yogurt maker bought on Amazon for $30. Look for Gourmia GYM1710 Yogurt Maker With 12 Glass Jars. It was a real winner! Thank your for the tips! Dairy intolerant… Can I make this with soy almond or cashew milk? Oh no! I mis read your instructions and put the yogurt culture in while the milk was still hot. Will it be ruined? Is there anyway I can save this? Just add some more yogurt after the heating time! The culture won’t be any good, but if you bought a tub of plain yogurt to start, then just add some more of the commercial yogurt. Have you tried to double this recipe. We have 8 kids and they love it with just fresh fruit and granola, needless to say it doesn’t last long! Thank you so much for sharing this healthy and inexpensive recipe. Yes! I make a whole gallon of milk into yogurt almost every time I make it! Nothing seemed to have happened with my attempt. What I was hoping to be yogurt was just lumpy milk with a little bit of a tangy flavor. Any ideas what went wrong? Were you able to test your temperatures with your thermometer? Most of the time if mine doesn’t set it’s because my milk was too hot when I added my culture and I killed it. Just wondering if you need to stir this pretty well to get it smooth? What kind of texture am I looking for? No, the more you stir it after it sits, the more it breaks down and get thin. You should be able to get a scoop of yogurt after the overnight rest when the yogurt culture has turned the milk into yogurt. If you want it thicker then you can strain it in cheesecloth. Stirring won’t help your texture. It’ll be nice and creamy. Can I half this recipe? This is the easiest recipe so far and I can’t wait to try it. Could I use commercial kefir as a starter instead of yogurt? You know what, I have no idea. From my experience with keifer, I don’t think it would work. Maybe try a small batch? Incubate 3-5 hours at a constant temperature of 110-degrees F. Do not shake or disturb during incubation. After 3 hours, check to see if yogurt is set by gently tilting the container. If yogurt is set and firm, place it in refrigerator and chill for 6 hours before serving. If not, continue to incubate. Check yogurt every hour and place in refrigerator as soon as it sets. The longer the yogurt incubates the tarter the flavor will be. If your yogurt sets within 3 hours, but you’d prefer more tartness, continue the incubation process for another hour or so. Such helpful tips, thank you! I’ve made this recipe twice now and haven’t had any problems! I did purchase a Euro Cuisine yogurt strainer on Amazon. The cheesecloth method was just messy for me. I also made a vanilla version. After the milk scalds, I added 1/4 cup sugar and a good splash of vanilla and whisked it in well. Tastes great and my family loves it. We can’t go back to store bought yogurt. I really like this Crock-Pot yogurt recipe. I use my Crock-Pot a lot and it’s fun to make yogurt this way and tuck a blanket around it for the night. It is really a nice and helpful piece of information. I happy that you just shared this helpful info with us. Please keep us up to date like this. Thank you for sharing. Can I just heat the milk in the crock pot, cool it to 110, add the yogurt starter and put in oven with the light on for 12 hours. I don’t have good luck with letting my yogurt mature on the counter. I think that’s a great idea! Let me know if it works! I’m so glad it was helpful friend and that it worked out well for you on your very first try. This is a fool proof recipe and so very delicious! This turned out so good!! Followed the temp (180&110F) rather than times. Really thick and creamy when strained. Thank u! Yes! I think I’ll update the actual recipe with the temps, I’ve found it the best way too. Thank you for letting me know it worked out well. ENJOY! How do you know when the yogurt expires? Horray for a successful batch of yogurt! Isn’t it crazy how much less it costs to make it at home. Is yogurt in the UK thick? Did you strain your homemade yogurt at all? I made this. I set my crockpot on high to scald the milk, because my crockpot has a thermometer that inserts through the lid, so I can keep an eye on the temp. It took about 11/2 hrs to reach 180 degrees. I did not have cheesecloth but I had a new pack of flour sack towels, so I used one of those. Cheesecloth would be better, though. When it was sitting wrapped in towels, I placed a heating pad on the lid, then covered with towels. Air conditioning was keeping the kitchen pretty cool, so this may have helped. I left it for 12 hours. The only part of the process I did not like was clearing a big space in my refrigerator for the yogurt to drain. Lol! I made a gallon, so it took up space! Now to the best part! This is the best yogurt I have ever eaten. The texture is like homemade pudding, as opposed to jello pudding, like most commercial yogurts. It wasn’t really cheap, because I used grassfed organic whole milk. It was the only kind I found that was not ultrapasteurized. Even though this will be a lot of yogurt for one person, I can sub it for sour cream in recipes. This is one staple in my diet that is worth making from scratch! Thank you for the lovely review! 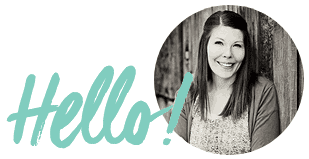 Love hearing other people’s tips, tricks, and successes! I do this frequently, then strain it with cheesecloth for a thicker, richer yogurt. I also strain a smaller amount longer for an even richer cream cheese like spread. Yes! Me too, my kids and husband like it nice and thick too. What brand and model slow cooker do you use? I’m asking because your first picture with the black crock pot looks like my Hamilton Beach 33250, but the picture with the green crock pot looks like my Rival model 3755. I haven’t tried your recipe yet, but I plan to! Yes and yes! I have those two and then a Kitchen Aid one too https://amzn.to/2Mk0P4B LOL right!? I tested this recipe in both the Hamilton Beach and the Rival (which I got for my wedding over a 13 years ago!). I am a bit confused! I scald the milk then let it sit for 3 hours or so til it reaches 110 degrees. I then stir 1/2 cup yogurt into 2 cups warm milk and stir back into warm milk. I replace the lid, cover with towels and let sit for 8-12 hours or overnight. Do i then strain it with cheesecloth or put in the frig first? Sorry for my confusion? Thanks! You got it! 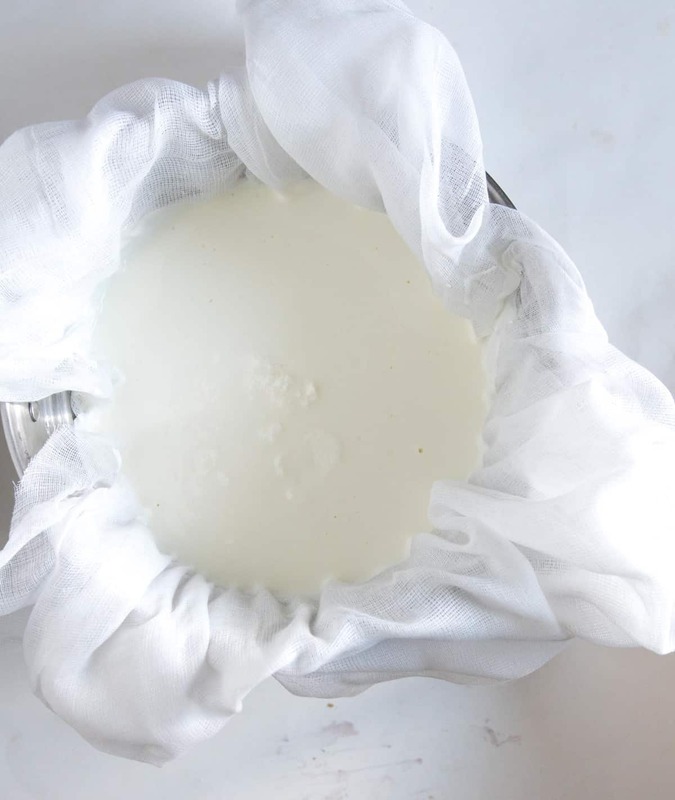 As far as the cheesecloth goes, you can use it to strain it after the 8-12 hours if you like a thicker yogurt or you can skip that step and put it straight in the fridge if you like a thinner yogurt. It’s an optional step depending on how thick you like your yogurt. Happy yogurt making! I’ve finally turned my family on to yogurt, specifically Greek & French Yogurt. My wife was the hardest to convince because she’s NEVER liked yogurt of any kind. My only problem now? Money! Everybody loves it so much (my wife especially since she’ll only eat the “OUI” yogurts from Yoplait) that each time I go grocery shopping my heart breaks when calculating the price. I decided to look up recipes and since I have a slow cooker (my favorite multi use kitchen gadget), I went with this one. Just made my first batch and it is gorgeous! The yogurty smell is amazing and the taste is beyond true deliciousness. I made a no-flavor, no sugar batch so that everyone can make it to their own preference. Thank you for posting your recipe. I now can provide my family with a healthy (I know what is in it, no preservatives or excess sugar) and delicious snack or breakfast everyday without breaking the bank. I LOVE comments like this! It’s so exciting to see you succeed in feeding your family. I hope you love it for years to come. All I got was MILK! Can I save it or do I need to start all over again? Thank you!! How disappointing! I’d warm it up the temp it needs to be and add the culture (yogurt) again. Normally if it didn’t work your milk was too hot and it killed your culture. That’s the issues 99% of the time. Or your culture/yogurt didn’t have any like cultures/bacteria in it to start with. Did you use a thermometer to check the temps before adding the yogurt?